UPDATE: In response to some saying my cook time is too long, I made this recipe again and decided to cut it down a bit. 2 Cans Diced Tomatoes – The kind that are seasoned with basil, garlic & oregano. If you don’t have the seasoned ones, you’ll need to add in your own seasonings. 8 oz. Cream Cheese or Neufchâtel Cheese – We use the low fat kind when using cream cheese. Grated Parmesan Cheese (not pictured) for topping! 1. Take your cream cheese or Neufchâtel out of the fridge, and let it sit while you quickly brown your meat. 2. 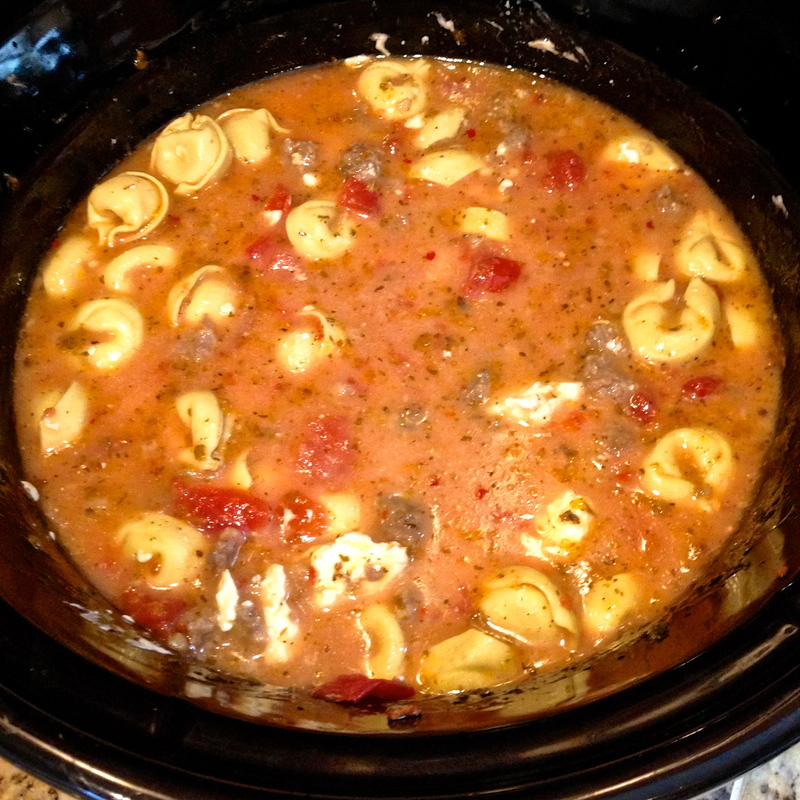 Add the sausage and tortellini to your Crock Pot. Pour the tomatoes, liquid and all, and broth over the top. Add your cream cheese to the Pot in chunks. 3. Give your Crock Pot a good stir to get everything evenly distributed, making sure the liquids are adequately covering the tortellini. 4. Cook on LOW for a total of 3 1/2 – 4 hours. Stir at 1 1/2 hours, and again at 3 hours, removing the lid for the last 30 minutes of cooking. This will give the sauce some time to thicken up. You can leave the lid off longer if you need more thickening time, but stir every so often. I made this this weekend we loved it I didnt use a crock pot thought modified it for stove top. Can you tell me about your modifications, please? I would like to try this tonight. Thanks. 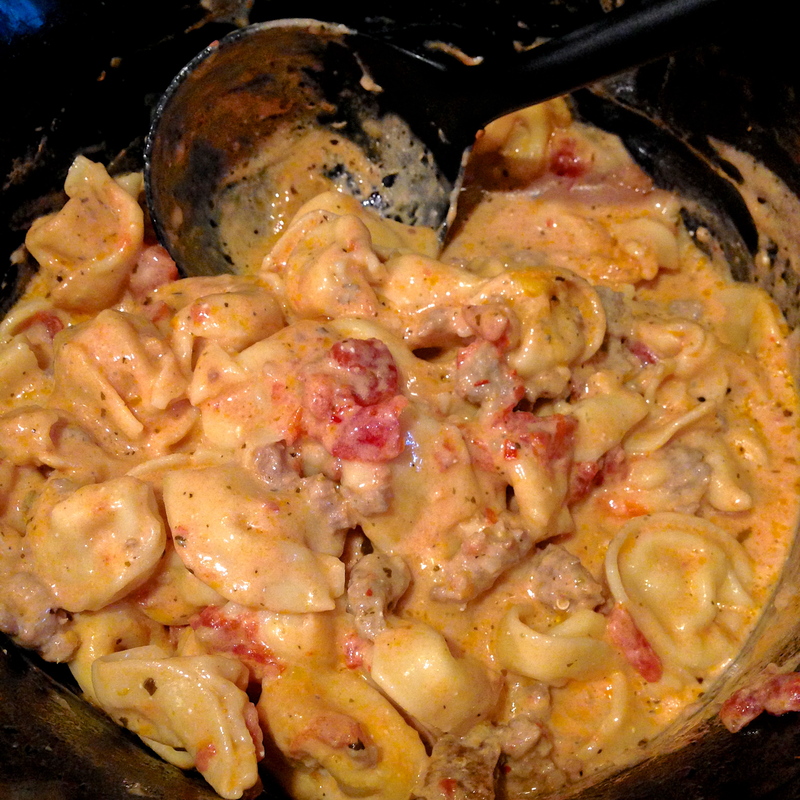 I browned and drained the sausage, added all ingredients and cooked for about 20 mins on very low heat, added frozen tortellini and cooked for another little while (until it gets to the consistency you want) on very low heat. Keep covered and stir periodically to keep it from sticking. Also, I just sat the cream cheese on top when I put the tortellini in until it was close to being done, then stirred in, that way it’s in there but not completely mixed in. Hope this helps! Could you use tomato sauce or does it have to be diced tomatoes? Could you use kielbasa instead of ground sausage? I dont the suggested pasta, all i have is elbow noodles. Im going to sub them instead but do i cook them before i put them in the crock pot? Can this recipe be done on stove top instead of crock pot?? yes I boil my noodles I dont use the chicken broth I use pasta sauce I dont use the tomato sauce. This was amazing! And even better the next day! I didn’t realize I needed to add frozen tortellini – I had fresh. So, I just waited until the last 30 minutes to add it in. The sauce was a bit runny, so I added the sauce to a skillet and boiled it down while adding flour. It worked out, but I will be sure I freeze the tortellini next time. It was a huge hit in my house! Thanks so much! I wonder how 1 can of diced tomatoes and 1 can of rotel would taste? I made this. It was very good. Parm Cheese made it better. I’d make it again although noodles alone were $9. A bit expensive. I did it in the crockpot. The taste was great! I get the Great Value frozen cheese tortellini from Walmart for 2.97 and we love it! Aldi has them for 2.00!! I have fixed this recipe 3 times. I did not change any ingredients but did cook it on the stove (only because the first time I forgot it was a crockpot recipe and it was too late in the day to start it). I browned spicy sausage in skillet then drained. Started cooking tortellini in pot with chicken broth. 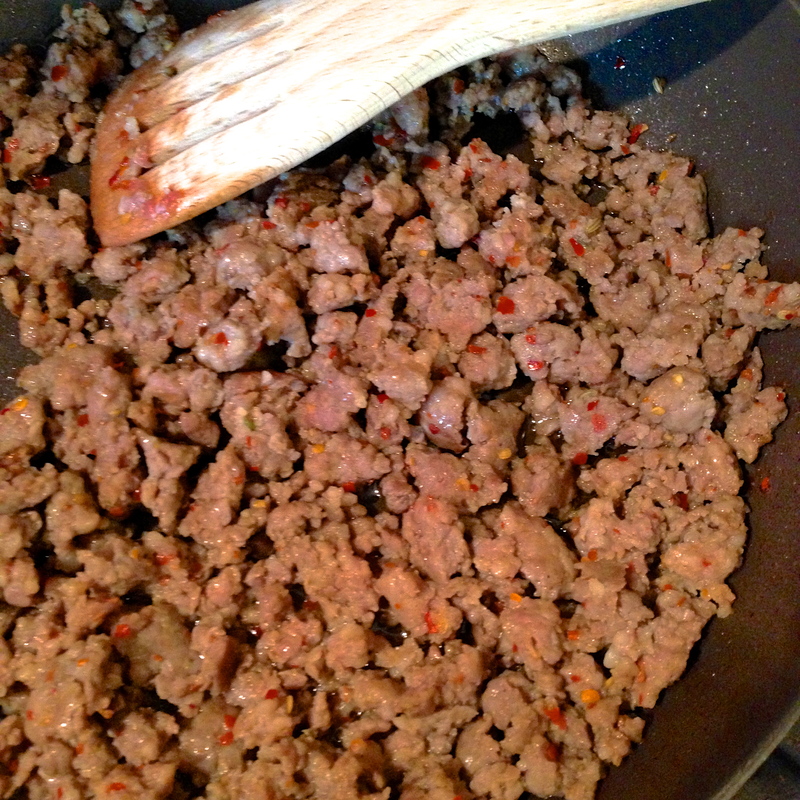 While pasta was cooking I added the diced tomatoes and cream cheese to the sausage in the skillet. When pasta was cooked I saved some of the cooking broth and discarded the rest (if you are looking for “soup” save all of the broth but my guys aren’t really soup guys so mine was more of a sauce than soup). I added the sausage mixture to the tortellini then added the reserved cooking broth from tortellini to the sausage/tortellini mixture until consistency I wanted. Serve with salad and garlic breadsticks! 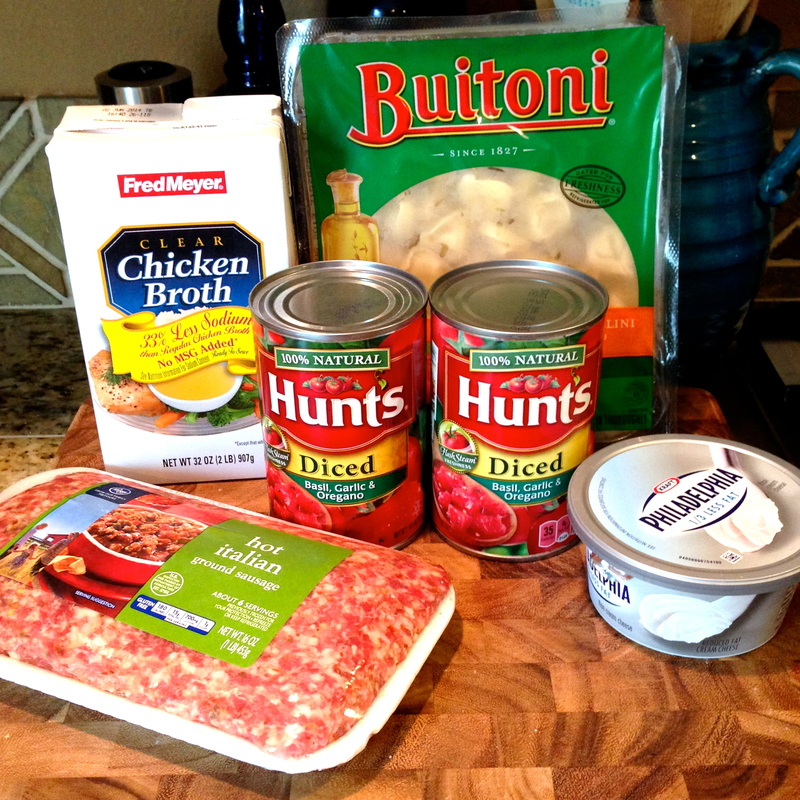 Pingback: So I bought some Sausage – The Pinterest Foodie! This is delicious! Because it takes so little time, I cook it on the stovetop. I love the italian sausage and creamy sauce. Yum! It’s one of my favorite recipes. Where is the link to your blog! Amazing this today for my wife and kids while I’m at work. Gonna add spinach to it just for added nutrition and color.I am a chef by trade and crock pot is not my favorite method. But this seems the way to go when I work all night. Add some chopped up spinach for some more flavor and veggies…it is delicious!! This is so good! My kids love it too! I have made it in the crockpot according to your recipe and on the stovetop if I have forgotten to get the crockpot started in time! Has anyone tried ricotta in place of cream cheese? I have a family of 4 that eats this and there’s still leftovers, it makes quite a bit. Tried this recipe tonight. My family was not a fan. Tasted like a boxed pasta. What’s the servings on this recipe. I have a large family of 7. It would feed 7. It makes a Lot! I dont know if you still keep up with this post because it was four years ago, but I’ve made this dish about 3 times now and I cant get it to thicken!! Please help! Hi Ashley, I actually followed another post and cooked mine on the stove top. I also boiled my pasta in the chicken broth. I then dumped around half of the broth with the pasta in my sasuage, tomato sauce (1can), chopped basil, parsley, and oregano then added the cream cheese and turned it on low. It was thick and creamy. Absolutely delicious. This came out very delicious, but my sauce didn’t thicken & is very soupy. I followed the recipe to a T. Any suggestions? Absolutely love this! Made it for the second time for a get together and everyone wanted the recipe! I follow the directions completely and it comes out perfect. I followed the recipe exactly. The sauce was extremely watery and I had to cook it on the stove (not what I was planning since this is supposed to be a crock pot recipe). Yes! It will just take much less time to cook, and I’d use less liquid. You may need to experiment! I feel you are doubling the recipie… should you leave it in the crock pot longer than 3 1/2 hours? That timing works for us! The meat is cooked so you’re just waiting for the sauce to come together and pasta to cook. Doesn’t seem to take long! I am going to make this with non-frozen tortellini. Do I cut back on time? I’d just throw the tortellini in in the last half hour or so! Do you thaw the tortellini or put it in frozen? Can you substitute the sausage for chicken? If so, how would you suggest I do that? Yes! I would suggest cooking the chicken in the crock pot with alll of the sauce ingredients (will come out as shredded chicken) and coming the pasta separately. Alternatively, you could cook some cubes chicken on the drive with Italian spices and then add that to the pasta & sauce from the crock pot just before serving. I’ve made this dish before and my son LOVES it! Thanks you!!! I’m making it tonight and was wondering if I could maybe set my crockpot on high to have it finished sooner? I didn’t get home in time like I had planned and need to get dinner finished. Any suggestions other then stovetop? I already have it in the crockpot. The sauce may not thicken as much and be a bit more soupy, but still tasty… did you end up doing that yesterday? How did it go? Fair in an Instant Pot?